Though you can find just about everything on the Plateau, a good pizza place was the one thing that eluded Mount Royal Avenue. 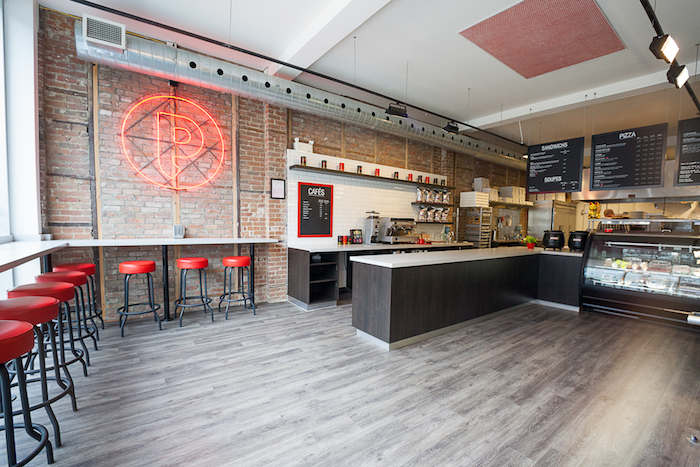 With Pronto arriving on the scene a few months ago, that’s all changed now and for the better. 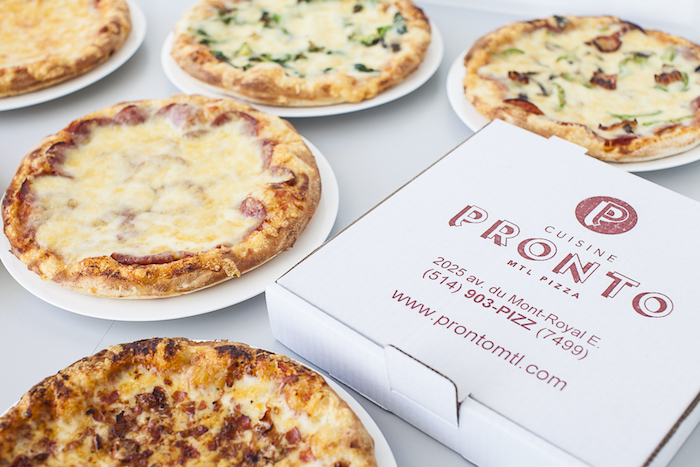 Pronto isn’t just a pizza place though. To limit it to one thing would be unfair. They are a great lunch spot and open until 9pm weekdays and 10pm on Friday and Saturday nights. They are a grocery store that features homemade frozen pizza (I could survive on this alone) and they also feature a few seats in house where you can eat everything you bought before you get home. The food at Pronto is great. We went to a media tasting one rainy night a week or so ago and we were treated to sandwiches, lasagna, salads and several different pizzas which were all distinctive and delicious. The selection of pizza ranges from vegetarian to meat lovers, spicy to simple and even all dressed (I’m enjoying the rapini pizza at the moment which is covered in cheese, rapini and delicious Italian sausage). There are well over 10 types of pizza to choose from and they come in four sizes depending on your crowd’s appetite. The lasagna is freshly baked in-house and comes loaded with meat and veggies but also comes with just the tomato sauce. Their sandwiches are also worth a try and feature chicken, steak, Italian sausage, prosciutto and vegetarian. They bread is fresh and crispy and the ingredients are very flavourful. As a place that prides itself on tradition (recipes passed down from Italian grandmothers) and uses only the best ingredients, Pronto is an excellent addition to Mount-Royal avenue and Montreal as a whole. Their location is wonderfully decorated with bright colours and big windows and the service is excellent. They deliver to customers in local vicinity and can prepare enough food to keep the hungry away. For more information on Pronto, visit their website here!